When you look at the definition of an Entrepreneur you might think to yourself, “Oh heck no, I don’t want that sort of responsibility!” But then you realize there is so much more to being an Entrepreneur than just the meaning of it. The definition of an Entrepreneur is – a person who organizes and operates a business or businesses, taking on greater than normal financial risks in order to do so. See what I mean!! Anyone in their right mind wouldn’t want to take on that responsibility, but millions do each and every day. Because there is NOTHING else that satisfies that Entrepreneurial spirit inside them. Nothing else compares to being their own boss, taking on the responsibilities and being rewarded for the sacrifices they have made. There is nothing that can keep them from their purpose and passions. It burns so strongly on the inside that they keep fighting, keep moving forward, keep getting up and keep being who God created them to be. 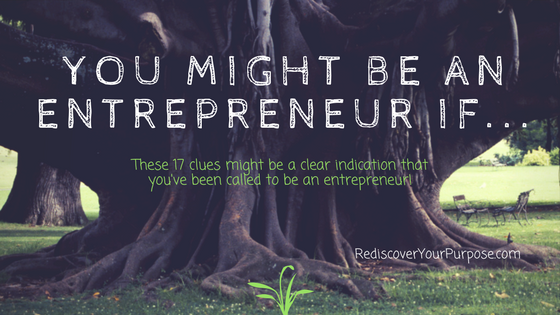 In the video posted below, my sister Melissa and I go over about 17 or 18 things that led us to the undeniable truth that we are indeed Entrepreneurs. FYI – Just to prove I’m a MultiPreneur, RediscoverYourPurpose.com was a company that my sister and I started but due to circumstances beyond our control, we realized that God had a different calling for each of us.